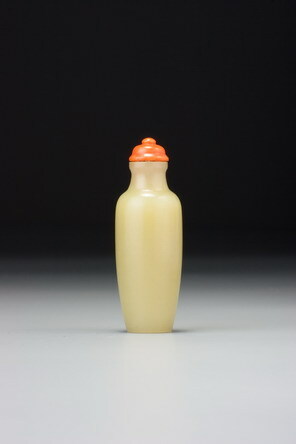 This unusually large silhouette agate bottle is one of the more complex designs in the entire field and certainly one of the most charming. The markings are unusually dark, almost black, and the design, although appearing to be largely natural, is in fact considerably edited, leaving a distinctly undulating surface. Planes of paler colour in the stone create a ground for the main subject, providing a rock on which the monkeys climb and a receding plane for the deer, adding depth to the otherwise flat, silhouette scene, and this is continued on the reverse with a natural cliff overhang, complete with foliage in dendritic markings defining one side of a gorge. 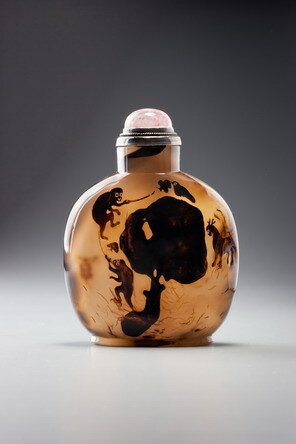 An agate snuff bottle with the same auspicious combination of motifs is in the National Palace Museum. The insects are identified by the museum as butterflies, and indeed they no more resemble bees or wasps than the insects on this bottle, but we should note that bees and monkeys are a common rebus for ‘enfeoffment as a marquis’, a standard wish for career advancement. The bird is properly understood as a magpie (que), which with a deer (lu) is a common rebus for juelu, ‘noble rank and the salary pertaining thereto’.